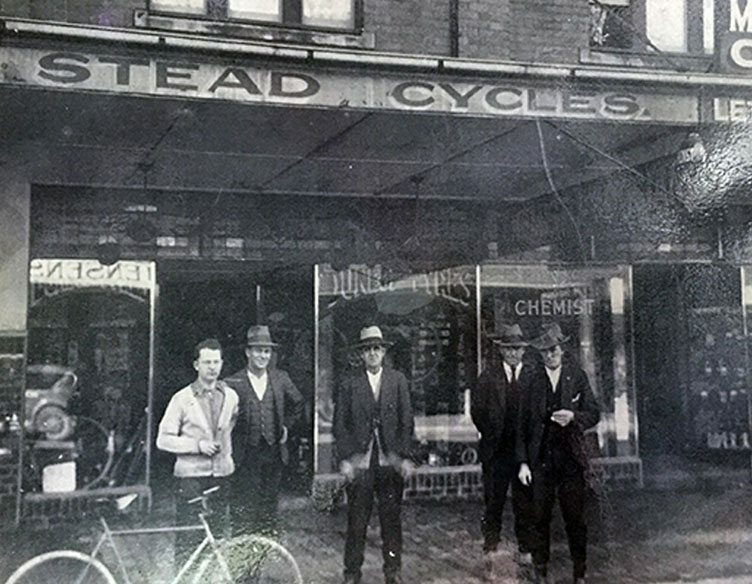 Stead Cycles was founded back in 1923 after Charlie Stead started his bicycle apprenticeship in Newcastle in the early 1900’s. When the 1st world war started Charlie and his brother Bert put their ages up and went to England for their training and then across to France to prepare for battle. After being wounded twice, Charlie went back to England where he was put on light duties in the Raleigh bicycle factory in Nottingham, where he continued his craft building bikes. When he returned to Australia he started his own business in 1923 on Maitland Road, Mayfield with his wife Ina Stead, later relocating to the eastern side of Maitland Road, where the old shop still stands today. They had two children – Len and Marie. After Charles passed away, Len and his mother ran the business. They had a large workshop at the bottom of the yard behind the business, where up to 10 staff including mechanics fabricated frames out of Reynolds 531C tubing, baked and enamelled them in the specially made ovens. This built up a reputation over the years. Years later Len with his wife Lydia and son Craig relocated the business to Beresfield where we rented a shop and built up the business name for approximately 7 years. As our business grew we needed a larger premises, so we purchased an old house in Beresfield at “29 Landor Street”. We built our new shop where we have been for the past 36 years and continued to grow our business with the help of our very loyal customers. With Aleshia Stead (manager), Craig’s daughter being the 4th generation, Stead Cycles Beresfield prides ourselves on giving the best and friendly service in the industry. We do the best assembly job and after sales service, which Steads actually started way back in 1923.